Nothing much but I'm still here! 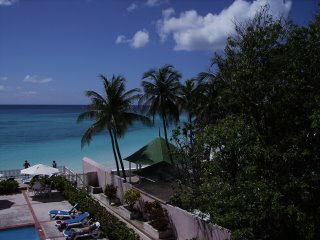 Here's a gratuitous but sunny photo from the balcony of our hotel in Barbados. My, how time flies when you're moving furniture, clearing out and recycling in an attempt to minimalise. I seem to be spending a lot of time right now on the minutae of life that I usually try to ignore or delegate. You know, the boring stuff, like buying bedside lamps and curtains and trying to keep things tidy because it's freshly decorated! I'm already bored with the 'house' issues and I give tidyness another few days. Still, next month the copy edits of PAST CHANCES will be back with me for checking and I'm actually looking forward to it. There's only so much domesticity I can take. I may grumble and whinge about writing from time to time when the going gets tough but I love it really. The new book is outlined in my mind but not titled yet...... I find the title of a book sooooo hard and yet I can't get into the swing of it until I've got one, even if it changes along the line. Before I can get back to the writing I have one last domestic task and that is to tidy my office. It has to be tidy before I can start another book properly with all the stuff from the previous one tucked away out of sight. I'm superstitious about it..... Silly? Yep! My office is a converted summer house halfway down the garden with insulation, carpets, heating and hundreds of books. It's MY place and I love it there. It's a bit of an effort to raise th enthusiasm to trog down there in winter but its nice in summer. Just think, only a few more weeks to mid-winter and then we'll be heading back towards summer again! Thanks to all of you who asked, Chav-Cat is better again and currently lying in the sun on the roof of the office waiting for wildlife to fall into his mouth. He seems to be gathering a fan-club which isn't really a good thing; I'm not going to tell him he's got mail in case it makes him even more arrogant and thuggish; he's the Grant Mitchell of the cat world! LInks will be up soon. Really really soon! Life's a beach and then you fry. So the holiday is over; in a flash;in the blink of an eye; gone; over. Went with BA my fave airline, as you all know, and stayed at the small Butterfly Beach Hotel on the not-so-hip South-West Coast and it was fabulous. I like small hotels and I'd recommend this one to anyone. It was a week of sea, sand and relaxation and we all enjoyed it. The highlight was a day out on the catamaran and snorkelling with the turtles which was such fun, they are so gorgeous, but..... how old am I? not old enough to have any sense apparently. SUNBURN! I've done it most of my life and I did it again last week. It seems my brain cells shrink in relation to the temperature. I've even written features about the dangers of burning but give me a snorkel and some blistering sun shining reflectively off the sea and I'm a loon. But it didn't spoil anything and I shall definitely go back as soon as possible. Chav-cat misbehaved while we were away. This time he needed surgery. More vet bills; nearly three hundred pounds so far and the stitches still have to come out. I may do it myself as punsihment! Fingers crossed that the insurance company haven't blacklisted him! This week it's the World Travel Market at Excel in Docklands; it's the largest trade travel show in the world and its the first time in sixteen years that I haven't got there. All the invitations to the various receptions are languishing in my inbox but jetlag has got the better of me for once. Usually on monday and tuesday I do the rounds of my favourite countries and its Tequila in Mexico, Vodka in Finland, Rum Punches in the Caribbean and Champagne in Florida (to mention but a few) but this year I failed the challenge. I am really missing having my photo taken with Elvis in Las Vegas and watching the dancers from the South Pacific. 1. When I lived in Singapore I had a pet Praying-Mantis called Chippy. He survived happily for quite a while as a house pet until my dad squashed him in the door of the bookcase by mistake. 2. I hate eggshell. I can't eat eggs cooked by someone else without tearing them apart to check for teeny-weeny shards of shell. 3. Despite travelling the world all my life, I've never been to Scotland or Northern Ireland. I must remedy that because now I've written it down in black and white I feel ashamed! 4. I am absolutely useless at maths. (ask my accountant!) my mind goes blank and even two plus two can a problem but I am a natural at spelling and punctuation. (I do make typing errors though) Lucky I'm a writer and not a book-keeper eh? 5. I have a SMART car which I adore. I've had it for four years and am still passionate about it. Its cute, its small and economical, and SMART drivers all smile happily and wave at each other! Now I really want the pink and silver special edition. Wow. that took me an age. Because I'm one of nature's chatterers there's not a lot people don't know about me! I've given myself the rest of this week off to catch up on all things domestic then next monday I'm back to it. As soon as I finish a book I heave a sigh of relief and relax. But then the old brain starts ticking away for the next book........ the plot is in place and the outline is on paper. Just a hundred thousand words or so to be typed! Oh Yay. My local team Southend U have beaten Man U. Well I never did! Must now decide who I'm going to tag... guess it has to be my friend and writer Lesley Cookman.